Oh, really? Let’s take the dare. Let’s talk about doctrine. Doctrine has become a controversial word these days. Comparatively few Christians wish to discuss the dreaded topic of doctrine. It may not be “politically correct.” Perhaps it is because so many are unsure of themselves. Many, who do not even know the Scriptures, are unwilling to look into them to see what the Bible really says. The word “doctrine” is not something to be feared or avoided. Doctrine simply means a “teaching,” or that which is taught by a religion or political party. The word comes from the Latin doctrina, meaning a codification of beliefs or a body of teachings, especially when used in a religious sense. We derive our word “doctor” from this word. The Greek word didache [διδαχη did-akh-ay'] is translated “doctrine” 51 times, and “doctrines” five times in the kjv. It is unfortunate that doctrine has been made out to be “the bad guy” in many Christian circles today. A sure way to cloud true doctrine is to bury it in false doctrine. Some view the word “doctrine” as almost a “curse” word. “Doctrine divides,” they parrot. “Don’t get into a doctrinal discussion, or you’ll get into an argument.” It would be difficult, indeed, to get them to sit down at a table with open Bibles and discuss various teachings of the Bible. People, by nature, do not want to change—they want to believe what they want to believe. And yes, it is true; Bible doctrine does divide. Correct doctrine divides truth from error! Many were astounded at Christ’s doctrine: “And it came to pass, when Jesus had ended these sayings, the people were astonished at his doctrine (Matthew 7:28; 22:33; Mark 1:22; 11:18; Luke 4:32; John 7:16). Christ said, “Think not that I am come to send peace on earth: I came not to send peace, but a sword” (Matthew 10:34–38, kjv throughout). This is because following true biblical doctrine will set you apart from commonly believed teachings about God and the Bible. It might even set you apart from the false teachings of your congregation. The buzzwords of this generation are experience, feeling, and perception. “If it feels good, do it” is the criteria. “If it tastes good, eat it. If you feel like it, say it.” However, the Bible teaches, “There is a way which seemeth right unto a man, but the end thereof are the ways of death. (Proverbs 14:12; 16:25). It’s time we set the record straight on the vital issue of doctrine! Let’s talk about doctrine. Why Is Doctrine So Important? Doctrine is indispensable to Christianity. True Christianity cannot exist without it. 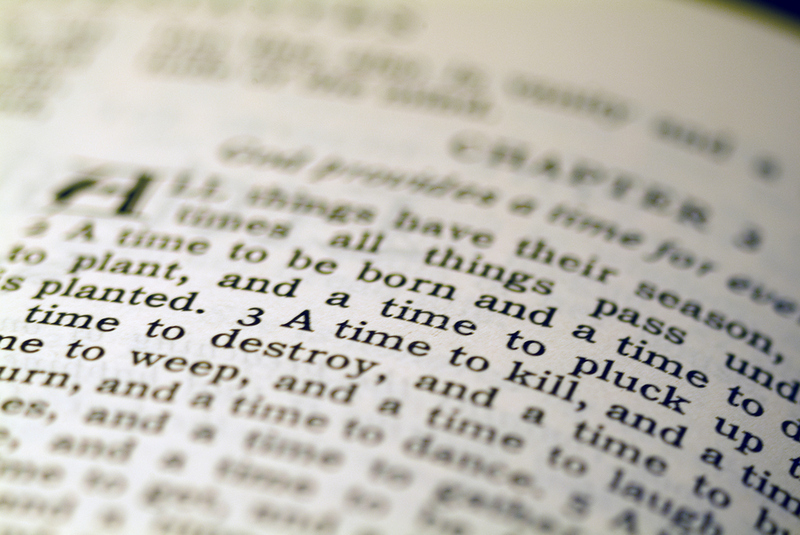 The New Testament repeatedly emphasizes the value and importance of sound doctrine, sound instruction (1 Timothy 6:3), and a pattern of sound teaching (2 Timothy 1:13–14). The apostles defended the faithful proclamation of the Gospel (Galatians 1:8). They coached Christian faith in doctrinal terms, then called for its preservation. God asks through the prophet Isaiah, “Whom shall he teach knowledge? And whom shall he make to understand doctrine? Them that are weaned from the milk, and drawn from the breasts. For precept must be upon precept, precept upon precept; line upon line, line upon line; here a little, and there a little” (Isaiah 28:9–10). Your Bible reveals there are the doctrines of Christ (Hebrews 6:1) and doctrines of devils (1 Timothy 4:1). In other words, there are true doctrines and false doctrines! Studying true doctrine is nothing less than a study of the law, mind, and character of God Himself. We are to put on the very mind—teaching, doctrine—of Christ Himself (Philippians 2:5; 1 Corinthians 2:16). That is, we are to learn to think and act as Jesus Christ thinks and acts. A few more man-made beliefs or doctrines we see dividing Christians today include the rapture and the timing of the rapture, young-earth vs. old-earth creationism, charismatic vs. non-charismatic, premillennialism vs. amillennialism, speaking in tongues, women preachers, eating in a restaurant on the Sabbath, Sabbath verses Sunday, the world’s holidays vs. God’s holydays, “soul-sleep” vs. the immortal soul, when is one born again, did Mary have other children, who, what, is the devil, is Jesus merely a created being, is Jesus God, is God a trinity, or a divine family, and many more. These are all doctrines held by various professing Christian groups! The doctrines of the Church of God International are summed up in our “Statement of Beliefs,” and are taken from the Bible itself. Send for your free copy of our Statement of Beliefs today. Our beliefs are explained in capsulated form and are backed up by many, many scriptures. You may wish to copy or chain reference them in your own Bible. The Bible alone is God’s written revelation to man, not feelings, not tradition, not doctrinal creeds of men! No doctrine is based on a single scripture. “For precept must be upon precept, precept upon precept; line upon line, line upon line; here a little, and there a little” (Isaiah 28:10). Be sure to request our free booklet, How to Study Your Bible for the rules of Bible study and information on how to mark your Bible. Teachers who attempt to siphon off some of God’s people must first open the door of their minds. They often come under the guise of “new understanding,” “new truth,” conviviality, and ecumenism. Political correctness has conditioned the majority of people to defend this supposed “open-mindedness” by saying we should not “judge” others but should have a spirit of “love” and “be more Christ-like,” etc. The basic idea is that we should seek fellowship among various groups and compromise—i.e., by ignoring differences in doctrine and practice, by putting everything we believe “on the table.” Beware! Do not become so “open-minded” that your brains fall out! Has anyone followed the case of Andrea Yates—the woman who drowned her five children in a bathtub because it was “God’s will?” The foundational issue she was grappling with was a false understanding—false doctrine!—of who and what God is! She stated that her desire was to kill her children so they would be kept from falling into Satan’s hands if they grew up, and to punish herself for being a bad mother. What else would cause this if not false doctrine—a false understanding of God? Or take the case of Jim Warren Jones, leader of the Peoples Temple Christian Church-Disciples of Christ. On the evening of November 18, 1978, in Guyana, Jones ordered his congregation to drink a concoction of cyanide-laced, grape-flavored Kool-Aid. In all, 918 people died, including 276 children. It was the greatest single loss of American civilian life in a non-natural disaster until the events of September 11, 2001. What was the basic error? False belief! False doctrine! Or the case of Marshall Applewhite Jr. of the Heaven’s Gate group, who led 38 of his followers to wear purple clothing and eat the poisoned purple pudding of death! He preached that suicide would allow them to leave their bodily “containers” and enter an alien spacecraft hidden behind the Hale-Bopp comet. Again, the culprit is misinformation—false doctrine! Or take the case of mother Eve: She listened to the subtle voice of the serpent and was persuaded to take of the forbidden fruit. Why? Because she listened to the devil’s lie. He promised her additional benefits. She gave way to false doctrine! Also Matthew 24:24: “For there shall arise false Christs, and false prophets, and shall shew great signs and wonders; insomuch that, if it were possible, they shall deceive the very elect.” How? By lies—by false doctrine! Yet again, Christ warned His followers, “Beware of false prophets, which come to you in sheep’s clothing, but inwardly they are ravening wolves. Ye shall know them by their fruits” (Matthew 7:15). Note that these false teachers come in disguise. They do not appear to be false teachers—they do not appear to be ravening wolves. Verse 22 shows that they don’t even necessarily deny Christ: they call Him “Lord, Lord.” They appear to be godly, sincere, good, moral people. Never forget: the devil is the father of lies (John 8:44). “For such are false apostles, deceitful workers, transforming themselves into the apostles of Christ. And no marvel; for Satan himself is transformed into an angel of light. Therefore it is no great thing if his ministers [yes, the devil has ministers!] also be transformed as the ministers of righteousness; whose end shall be according to their works” (2 Corinthians 11:13-15). The devil will go up to 99 percent truth to slip in his one percent error, because he knows that, like leaven, false doctrine will spread and grow until it consumes entire congregations. What is their methodology? By craft, speculation, presumption, supposition, and guesswork, they plant “new” ideas into people’s minds—in other words, False doctrine! Acts 20:30: “Also of your own selves shall men arise, speaking perverse things, to draw away disciples after them.” That is, to cause schism in the church or congregation in order to get a following to support them. Satan’s strategy is “divide and conquer,” hence all the splits and schisms in the churches today. Beware of those who insist on a hierarchal church government (the doctrine of the Nicolaitanes referenced in Revelation 2:6,15), or that they are the “one and only” true church. Christ said, “I am the vine [singular], ye are the branches [plural]” (John 15:5). Christ said, “And other sheep I have, which are not of this fold” (John 10:16). The Bible definition of a Christian is found in Romans 8:9: “Now if any man have not the Spirit of Christ, he is none of His.” And to whom does God give His Holy Spirit? “… the Holy Ghost, whom God hath given to them that obey him” (Acts 5:32). It matters not to which computer data bank one may belong to; what matters is, do you unconditionally belong to Jesus Christ? The prophet Jeremiah predicted, “The prophets prophesy falsely, and the priests bear rule by their means; and my people love to have it so” (Jeremiah 5:31). Paul warned Timothy, “For the time will come when they will not endure sound doctrine; but after their own lusts shall they heap to themselves teachers, having itching ears; And they shall turn away their ears from the truth, and shall be turned unto fables” (2 Timothy 4:3–4). One of the surest ways to become a victim of false doctrine is to think that it is not dangerous and you don’t need to be concerned about it. If you play with a live snake’s head long enough, it will bite you. People tend to seek consistency in their beliefs and perceptions. So what happens when one of our beliefs conflicts with another previously held belief? The term “cognitive dissonance” is used to describe the feeling of discomfort that results from holding two conflicting beliefs. When there is a discrepancy between beliefs, something must change in order to eliminate or reduce the dissonance. Cognitive dissonance occurs when one finds that what he or she has always believed is in conflict with what the Bible says. When two things are opposites, they cannot be reconciled. If we embrace true doctrine, we must be against its opposite—false doctrine. The stronger we favor a truth, the stronger we should oppose its opposite. If I favor a democratic republic, I must oppose dictatorship. If I favor life, I must oppose death. If I favor light, I must oppose darkness. The more I value the one, the more I must object to the other. Error is the opposite of truth. If I appreciate truth, then I must oppose error. To suggest that false practices do not matter much is to necessarily imply that truth does not matter much! Every passage that emphasizes the importance of truth, simultaneously emphasizes the danger of error. The more we care about truth, the more firmly we will oppose error. “The fear of the Lord is to hate evil: pride, and arrogancy, and the evil way, and the froward mouth, do I hate” (Proverbs 8:13). “Through Thy precepts I get understanding: therefore I hate every false way” (Psalms 119:104). See parallel passages at: Psalm 119:128,163; 36:4; 97:10; 101:3; Amos 5:15; Micah 3:2; Zechariah 8:17; Matthew 6:24; and Romans 12:9.
Who, What is Behind the Deception of False Doctrine? As we know, “… that old serpent, called the Devil, and Satan… deceiveth the whole world” (Revelation 12:9). To deceive means to cause someone to believe something that is not true; to trick, mislead, falsify, dupe, defraud, or victimize. We are warned, “Submit yourselves therefore to God. Resist the devil, and he will flee from you” (James 4:7). When someone tells you that false teaching is not a big problem and you don’t need to be very concerned about it—just love the brethren and don’t worry about wrong doctrine—he is teaching you a false doctrine when he says it! And it is just a matter of time before he will try to get you to accept other false teachings! Not every false teacher will belittle the danger of false teaching. But anytime a man does tell you that false teachers are not a serious danger, you can be sure he is telling you that either because he is a false teacher or because he is under the influence of false teachers! What should we do about it? How can we escape the danger of false teaching? “For the mystery of iniquity doth already work: only he who now letteth [restrains and hinders] will let, until he be taken out of the way. And then shall that Wicked be revealed, whom the Lord shall consume with the spirit of his mouth, and shall destroy with the brightness of his coming: Even him, whose coming is after the working of Satan with all power and signs and lying wonders, And with all deceivableness of unrighteousness in them that perish; because they received not the love of the truth, that they might be saved. And for this cause God shall send them strong delusion, that they should believe a lie” (2 Thessalonians 2:7–11). (2) STUDY GOD’S WORD DILIGENTLY. “Prove all things” (1 Thessalonians 5:21). If we proved a doctrine once, we can prove it over and over! The way to recognize error is to compare it to the truth (Acts 17:11; 2 Timothy 2:15; 3:16, 17). “Thy Word is truth” (John 17:17). (3) HONESTLY EXAMINE EVERY DOCTRINE AND PRACTICE before we accept it (2 Corinthians 13:5). Further, if we can’t teach it to others from the Bible, we don’t know it well enough ourselves! God’s Word says, “For I give you good doctrine, forsake ye not My law” (Proverbs 4:2). “If you put the brethren in remembrance of these things, you shall be a good minister of Jesus Christ, nourished up in the words of faith and of good doctrine, which you have attained” (1 Timothy 4:6). What about you and me? How much do we care about truth? Do we care enough to study diligently, to remove error from our lives, and serve God faithfully? If you know the truth, have you obeyed it? Are you living a faithful life as a Christian? Beware the dangers of drifting! Beware of Christian compromise! In this article we’ve talked about sound doctrine. We are told to do so (Titus 2:1). This should be our central focus, first, last, and always, testing our beliefs to see if they truly do line up with what God has said about Himself in the Bible.